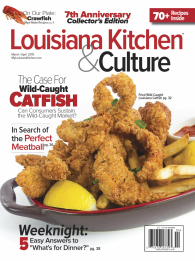 Recipe courtesy of Haydel's Bakery, New Orleans for Louisiana Kitchen & Culture magazine. 1 cup milk heated to 110ºF. *Mix colored sugar (purple, green, and gold) using granulated sugar and paste food coloring, found in the baking aisle of most craft stores and cake decorating stores. In a stand mixer with paddle, cream together sugar, salt, and shortening. Add eggs; cream until light and fluffy. Meanwhile, dissolve yeast in milk; let sit 10 minutes or until foamy; add flavoring of choice. Add yeast and milk mixture to sugar and shortening mixture; stir to combine. Replace paddle with dough hook. Add three cups flour one cup at a time, stirring on low speed until thoroughly combined between additions. Add remaining cup in quarter cup increments; dough should be elastic and not sticky, and should pull away from the sides of the bowl; add more or less flour as necessary. Dough temperature out of the mixer should be about 80ºF. Turn out onto floured surface and knead by hand until smooth and pliable. Allow dough to rest for 1 to 1½ hours. Roll out in oblong shape about 18 inches long. Coat with vegetable oil. Sprinkle evenly with sugar and cinnamon; roll up dough and knead to incorporate. Roll back out into an oblong and cut into three strips; braid. Let rest 30 minutes or until braided dough can be stretched easily to twice its length; form into an oval. Sprinkle top with colored sugars; bake at 370ºF for 12 to 15 minutes, until lightly browned. Note: As shown here, confectioner's sugar is mixed with a little water, vanilla flavoring, and food coloring and used to ice the king cake.